Below are common attributes associated to Catlin's Giant Ajuga. Become a care taker for Catlin's Giant Ajuga! Below are member comments regarding how to plant Catlin's Giant Ajuga. No comments have been posted regarding how to plant Catlin's Giant Ajuga. Be the first! Do you know how to plant Catlin's Giant Ajuga? Below are member comments regarding how to prune Catlin's Giant Ajuga. No comments have been posted regarding how to prune Catlin's Giant Ajuga. Be the first! Do you know how to prune Catlin's Giant Ajuga? Below are member comments regarding how to fertilize Catlin's Giant Ajuga. No comments have been posted regarding how to fertilize Catlin's Giant Ajuga. Be the first! Do you know how to fertlize and water Catlin's Giant Ajuga? Below are member comments regarding how to deal with Catlin's Giant Ajuga's pests and problems. No comments have been posted regarding how to deal with Catlin's Giant Ajuga's pests and problems. Be the first! Do you know how to deal with pests and problems with Catlin's Giant Ajuga? Looking for Catlin's Giant Ajuga? Get Catlin's Giant Ajuga fresh and large directly from the grower to your garden! Buy Catlin's Giant Ajuga online from the nursery wholesalers and save BIG! after flowering cut back ajuga to the groud to revive foliage.Also keep an eye out for "reversion" sometimes variegated plants like this can send out runners that are all green which will eventually take over, pull these out. Other than that just cut Ajuga away from where you do not want it. Plant Catlin's Giant Ajuga in sites that provide shade or morning sun with afternoon shade and moist but well-drained, somewhat fertile soil. Catlin's Giant can be planted in mass as a groundcover however I typically use it in smaller patches or as an underplanting in shady shrub beds and perennial gardens. If you do decide to plant Catlin's Giant Ajuga in mass as a groundcover, it might be necessary to do some site preparation. First, you'll need to eliminate any weeds or grasses that are growing in the planting area. There are many ways to do this however spraying with a weed killer is easiest and most efficient. If you are planting groundcover plants under a tree, and intend to till the soil before planting, be careful not to till to deep and damage tree roots. Depending on how fast you want to the groundcover plants to fill and cover the area, I recommend spacing them about half the distance as their listed, mature width. If the plant is listed to grow 18 inches in width, space the plants 9 to 12 inches apart. When planting between stepping stones or pavers it might be necessary to divide plants into smaller sections that will fit between gaps. Before planting, space all plants out in the planting area, or use marking paint to mark the planting spots. Begin by setting out a row of plants along the edge of the perimeter, making sure to space them at a distance far enough from the edge to allow for future spreading. For example, plants that are spaced 12 inches apart should be spaced at a distance of at least 6 inches from the edge of the bed or surfaced area. After setting out the first row, stagger the plants on the second row, and so on until you have filled the area. After all of the plants have been set in place, or marked, you may begin planting. If you mulched the planting area in advance of planting, rake back a small area of the mulch in order to dig planting hole. To plant, dig a hole 2 times as wide, or more, than the container the plant came in. Mix in an organic soil ammendment such as mushroom compost at a 50/50 ratio with the soil removed from the planting hole. Remove the plant from the container and scratch root ball to loosen feeder roots. Place plant in hole making sure that the top edge of the root ball is level or slightly above the level of the ground. Backfill around the rootball with soil mixture tamping lightly as you go to remove air pockets. Water thoroughly and cover with a 1 to 2 inch layer of mulch if you haven't already done so. 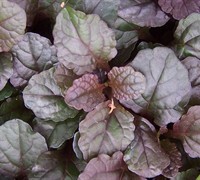 I fertilize Ajuga with a slow-release, mild natural or organic plant food in spring. Crown rot can be a problem if there isn't good air circulation. Provide supplemental water during prolonged periods of hot, dry weather. Afternoon sun is not good for Ajuga. Morning sun or shade is best. This is a spreading plant so do not use as a border for lawns unless there is an edging to prohibit its growth into the lawn.